This evening I made a delicious dinner salad, full of wonderful grape tomatoes. Yes, tomatoes. When I went to the supermarket today, shoppers were skirting around the tomatoes while I dove right in for the succulent grape, heirloom, and vine-ripened ones. Even though some people are scared of the juicy red fruit after the recent salmonella scare, the truth is that the vast majority of tomatoes are unaffected and most states that grow tomatoes are not implicated in this outbreak. This tainted tomato outbreak is, however, surprisingly different from previous documented outbreaks. The CDC, FDA, and others say that this time washing produce or discarding tomatoes with broken skin is not enough to protect yourself against the bug. Three varieties—red plum, red Roma, and round red tomatoes—have been implicated in sickening more than 150 Americans in 23 states since April. The tomatoes appear to be primarily from Florida, the leading tomato-producing state. As a result, most restaurants (including McDonald's and Burger King) and major supermarket chains have taken tomatoes off the menu and store shelves. Previously it was thought that salmonella bacteria could wind up on the skin of produce and if there was a break in the skin or when you sliced it, the bacteria may penetrate into the flesh of the produce. However, the news about this new outbreak is especially twisted. The salmonella causing the outbreak is a very unusual strain, Salmonella Saintpaul, which may have the ability to penetrate the skin of tomatoes and infect the entire flesh of the tomato. Therefore, the tomato may not need a crack or break in the skin for the bacteria to penetrate the flesh; hence the recommendation to avoid all the potentially implicated varieties. Aside from this scare, tomatoes are one of the healthiest pieces of produce you can enjoy. They are an excellent source of vitamin C and beta-carotene, and one of the richest sources of lycopene, a phytonutrient that has been shown to fight cancer. So don't let this foodborne illness scare you away enjoying one of summer's perfect picks. Here's what you can do. Avoid the three types of fresh tomatoes that have been implicated: red, Roma, and plum. Don't assume that organic tomatoes are safer than conventionally grown ones; the FDA warns that organical produce could be affected as well. Stick to eating vine, grape, cherry, heirloom, or homegrown tomatoes. Throw tomatoes on the grill if you are nervous about the varieties that you're buying. Cooking any food thoroughly kills the salmonella bacteria. 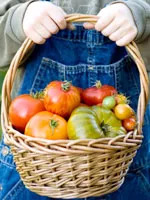 Keep current with FDA reports and the list of states growing tomatoes that are not linked to this outbreak at FDA's Hot Topics page. For example, tomatoes grown in California and Texas are not associated with this particular incident. Consider canned. You can make many of your favorite tomato-based recipes with canned tomatoes. An added benefit is that canned tomatoes retain the same nutrients as fresh tomatoes, and research shows that the lycopene in canned tomatoes is more readily absorbed than fresh. Salmonella is a bacterium that resides in the intestinal tracts of humans and animals. The bacteria are usually transmitted to humans by eating foods that have become in contact with the bacteria through manure used as fertilizer. You will know if you have contracted a salmonella infection. Most infected people suffer fever, diarrhea, and abdominal cramps 12 to 72 hours after infection. The illness tends to last for four to seven days. If you're an adult in decent health, it will make you very ill; for children, the elderly, and those with a compromised immune system, an outbreak can be deadly. If you suspect that you or someone you know has contracted a salmonella infection, contact your area FDA complaint coordinator.